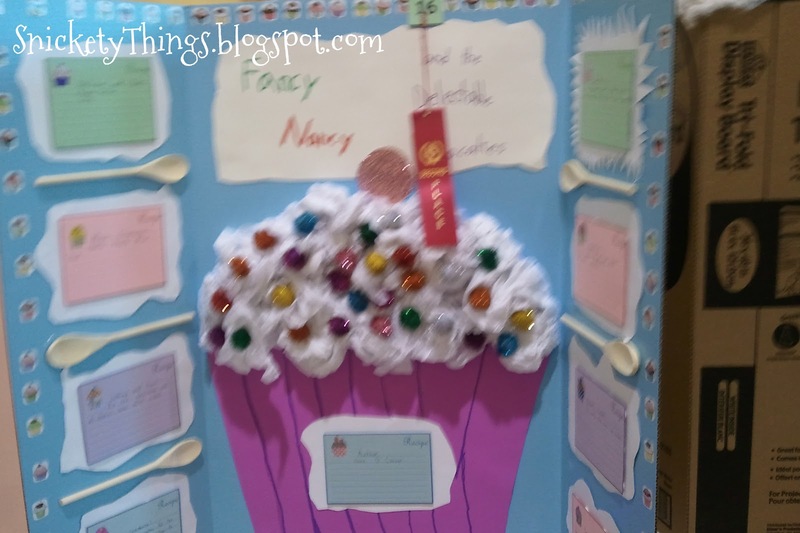 Did you read yesterday's Fancy Nancy post? 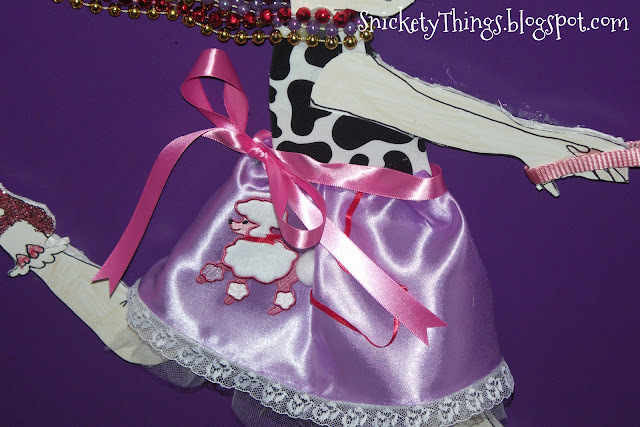 Here are some bonus Fancy Nancy things. 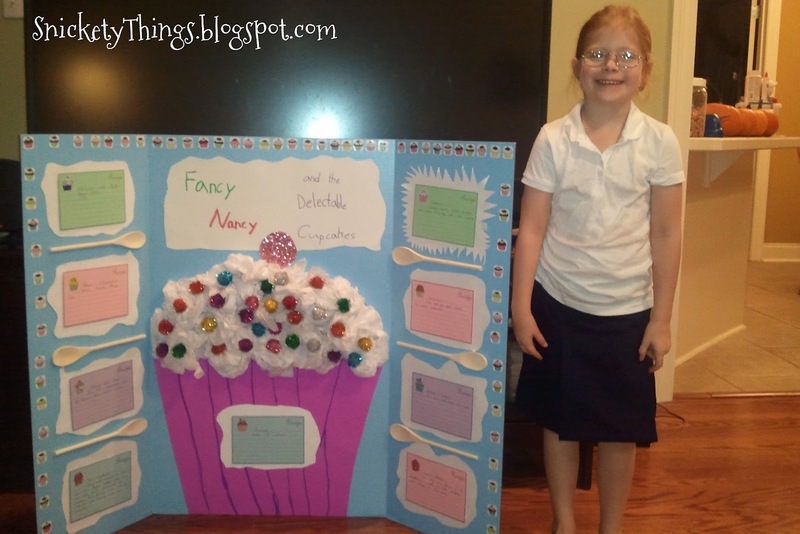 My daughter loves Fancy Nancy so much she did her first two reading fair projects on Fancy Nancy books. 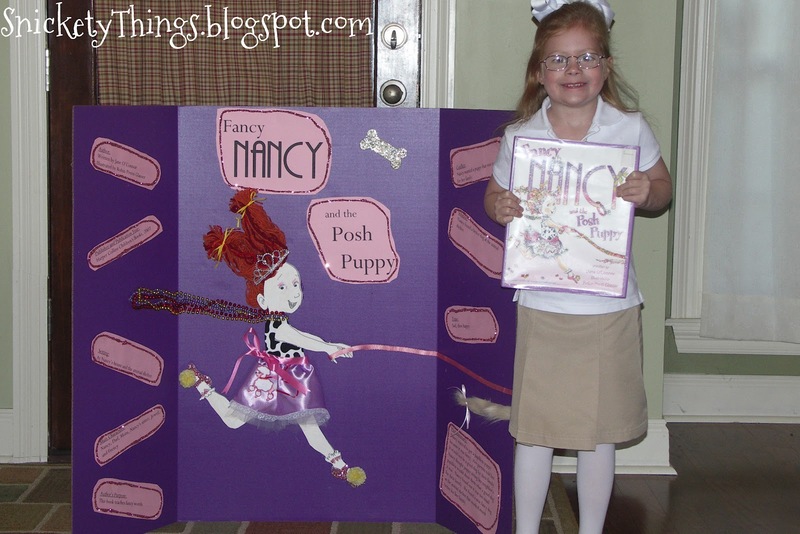 In kindergarten she chose to do Fancy Nancy and the Posh Puppy, which was also part of the theme for her fifth birthday. Here she is holding the book next to her board. She wanted the board to look like the cover of the book. She typed all of her information into the computer and printed it on pink card stock. She outlined it all with pink glitter. I started by letting her trace a picture of Nancy I projected using my Tracer Jr. Since it was on foam board, I helped her cut it out. She colored Nancy to look like the book. 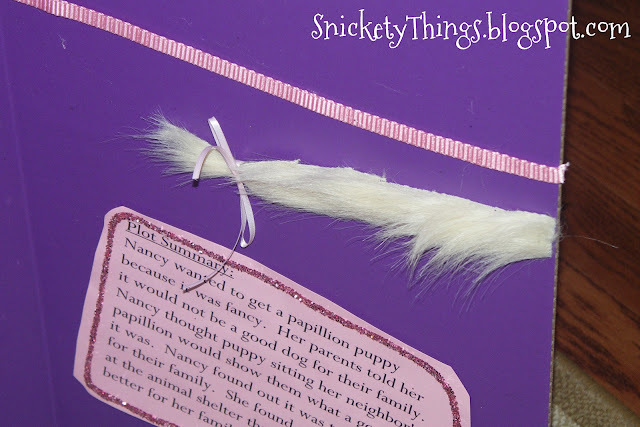 She made Nancy's hair out of a bunch of scrap yarn I had laying around. She found a broken tiara and glued it on to her head. Here is a close up of the outfit she made. She was so excited because I let her use by big fabric scissors to cut. She cut the shirt out of some cow print fabric I had. She made a big rectangle out of some scrap purple satin and glued the lace to the bottom. I ironed the poodle on it for her and she gathered and glued the whole thing around Nancy. There is even a bit of tulle she tucked under the skirt to make it poofy. Those beads were left over from the dress up chest. She glittered Nancy's shoes but thought they needed more. I gave her one of my pom-pom makers and let her make a couple for the shoes. Frenchy's tail was a bit of fun fur glued on to the board. The leash and the tail go off the board just like the side of the book. I did help her with the hot glue to make sure everything stayed on the board. She ended up getting third place in the kindergarten class for this one. I was not surprised when she decided to do Fancy Nancy again in first grade. This time she chose Fancy Nancy and the Delectable Cupcakes. I let her do everything except hot gluing the spoons down. She wanted to hand write her descriptors this time. Since the book was about food, I let her use some recipe cards I had, which was perfect since they were lined. She put little cupcake stickers in the corner of each card. We found those wooden spoons at Dollar Tree in packs 3/$1. 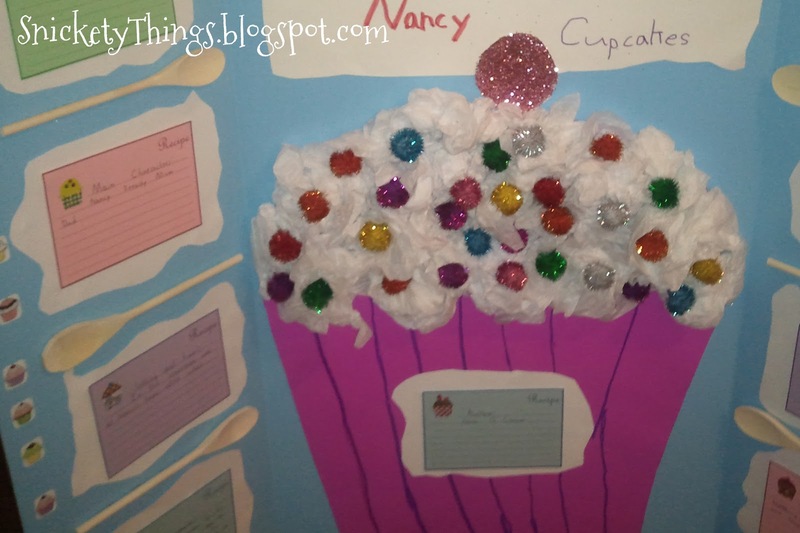 The cupcake "wrapper" is a piece of purple poster board she cut into that shape and drew lines on. The icing is wadded pieces of tissue paper she held on with Aileen's Tacky Glue. The "sprinkles" are small metallic pom-poms. She cut a circle out of white cardstock and covered it in pink glitter (the same glitter used on the other board) for a cherry. I volunteer in her class one day a week and the teacher suggested I go look at all the boards on display. I was pleasantly surprised to find a second place ribbon hanging on her board (out of all first grade). I know it is blurry, but I snapped it quickly with my phone before a group of students passed by. I'm sure she would love to do another Fancy Nancy board for second grade, but she will have to pick a story more on her level. I love the giant cupcake! My daughter loves Fancy Nancy books- she's such a fun character. This project turned out Great! My now ten year old daughter LOVED Fancy Nancy when she was younger too! Have a wonderful weekend! Thank you! You have a wonderful weekend, too. Thank you! 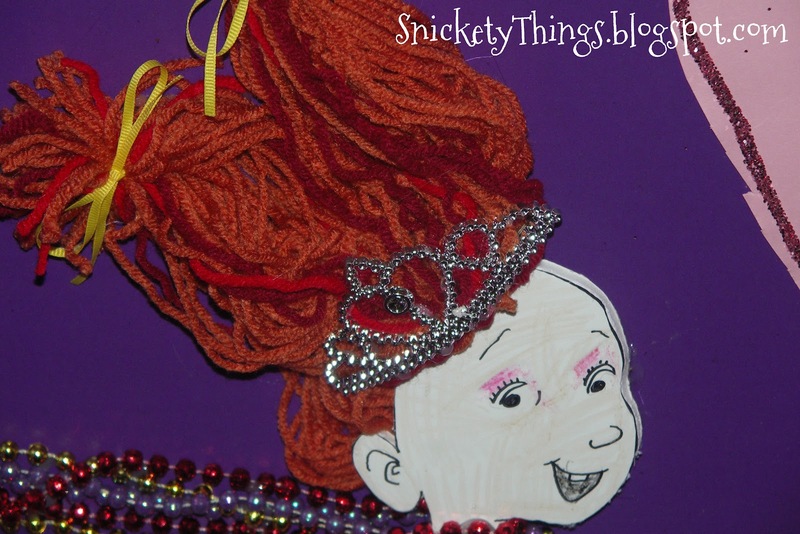 You will have so much fun doing Fancy Nancy things. Very cute ideas. Your daughter is very creative. Fancy Nancy is one of my faves too. I see you are a Liebster blog also! Thank you! I guess it helps to have a crafty mom with lots of stuff laying around. Wow - awesome job! My 6 year-old is a Fancy Nancy fan, too! What a wonderful talented youngster! I know you're extremely proud of her. I have a great granddaughter that is quite talented too. How adorable! 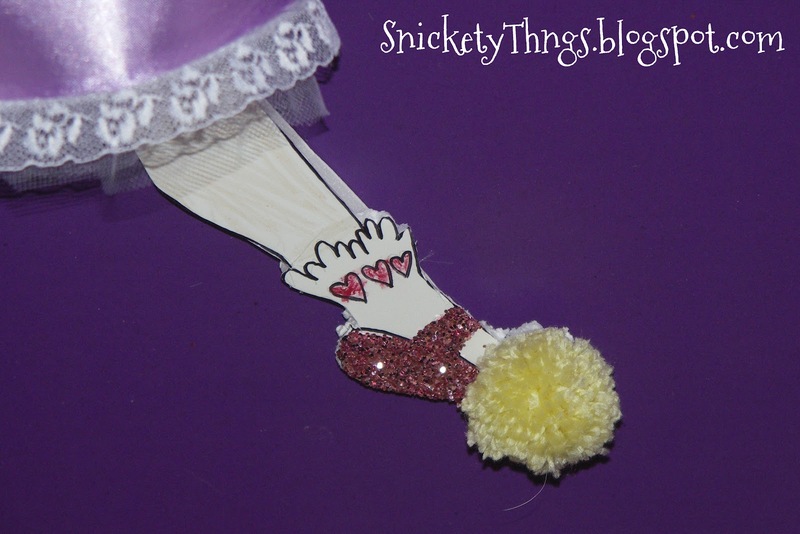 My very fancy four year old is a huge Fancy Nancy fan, too, and I could totally see her loving something like this. Love ! As a Language Arts teacher, this is a fantastic showing of her love for her book! Thanks for linking to Handmade Tuesdays! Thanks. She really does love books and reading. So cute! I'm a teacher and I have to say this would definitely gone over so well with me. Love it! Thanks so much for sharing at Whimsy Wednesdays. Stop back tonight for a bloglovin blog hop. If you're unfamiliar with bloglovin you can find out about it at www.thenymelrosefamily.blogspot.com/2012/02/i-heart-bloglovin.html. Thank you! I'm so happy she likes to read and wants to do this kind of stuff. WOW! I'll bet her project was the absolute best one there. So . . . FANCY!